This project focuses on a critical demographic in the United States – Latinos. Latinos are already the second largest racial/ethnic demographic in the U.S. and will be nearly a quarter of the population by mid-century, with even larger impacts on American politics, culture, and society than they have today. 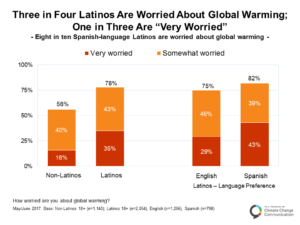 Prior YPCCC research has found that Latinos are more convinced global warming is happening and human caused, and more worried and supportive of policy than any other demographic group in the U.S. Although Latinos appear to have stronger pro-climate beliefs and attitudes than other demographic groups, some research has found that Latinos might be less likely to take action on climate change. Understanding this potential gap represents a critical opportunity to advance the national conversation on climate change and promote engagement in the Latino community. Advance scientific understanding of Latinos’ climate change beliefs, risk perceptions, policy support, and behavior. 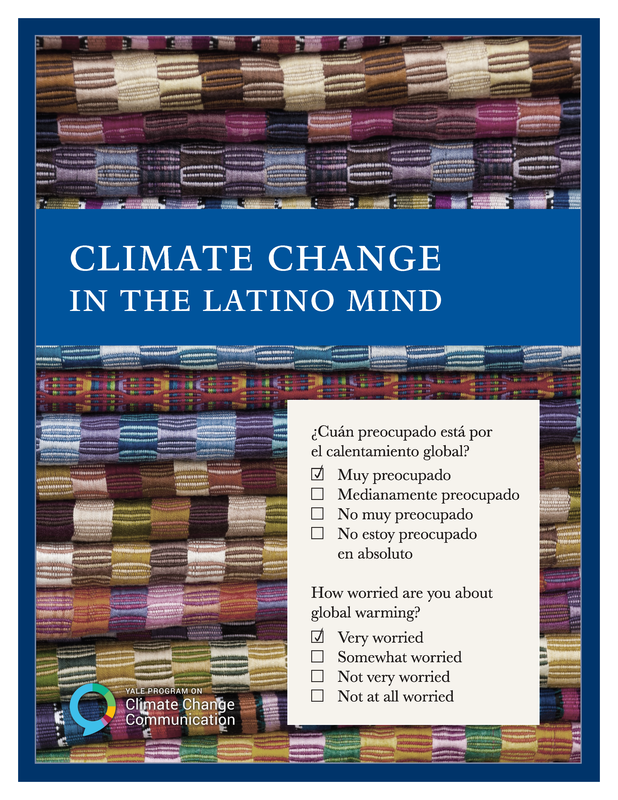 Use these research insights to increase climate change awareness, acceptance, and action within the Latino community. Help Latino leaders engage their communities in climate change solutions. Our first survey of the Latino community was conducted in the second quarter of 2017. The full report from this survey can be read in English here. (Press release for the publication can be found here.) Overall, we find a very consistent pattern: Latinos are much more engaged with the issue of global warming than are non-Latinos. Latinos are more convinced global warming is happening and human-caused, more worried about it, perceive greater risks, are more supportive of climate change policies, and are more willing to get involved politically. 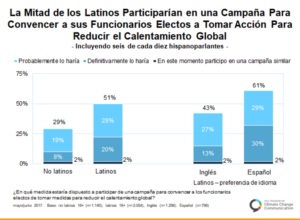 Within the Latino community, we find another consistent pattern: while Latinos, generally, are more engaged with the issue of global warming than are non-Latinos, Spanish-language Latinos are even more engaged than English-language Latinos. Para leer el reporte en español, haga clic aquí. (Comunicada de prensa aquí.) En general se observa un patrón consistente: los latinos se encuentran comprometidos en mayor medida con el tema del calentamiento global que sus pares no latinos. Los latinos también están más convencidos de que el calentamiento global es una realidad presente y que es causada por la actividad humana; a su vez, se encuentran más preocupados al respecto; perciben mayores riesgos y apoyan en mayor medida las políticas sobre cambio climático y se sienten más motivados a involucrarse políticamente. 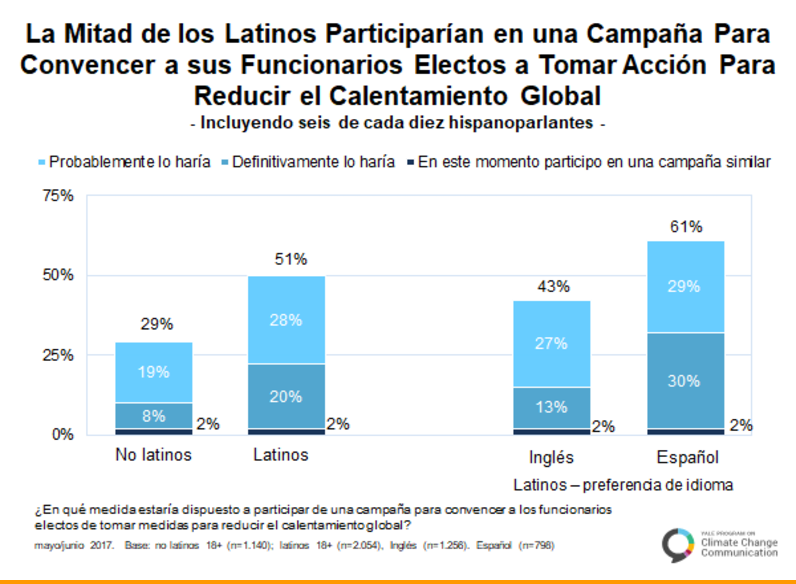 Dentro de la comunidad latina encontramos otro patrón consistente: mientras que los latinos en general se encuentran más comprometidos con el tema del calentamiento global que sus pares no latinos, aquellos que son hispanoparlantes están aún más comprometidos que los latinos angloparlantes. In a recent study, we explored differences in climate change activism between Latino and non-Latino White Americans, and key predictors of engagement. We found that Latinos are more likely to have contacted government officials about global warming in the past and are more willing to contact government officials in the future, indicating that in some important respects, Latinos are leading the way. Informed by our research, we have produced and broadcast radio stories about the Latino climate change experience on Yale Climate Connections. Through the Hispanic Communication Network, these episodes are available in transcreated Spanish language versions on HCN member radio stations. You can find and listen to these episodes here. Public service announcements (PSAs) are also playing in English and Spanish on Hispanic radio stations around the country. The PSAs are in a serialized story form (called a “radio novela”) popular in the Latino community. They focus on how a fictional family addresses global warming challenges, for example, handling heat on the soccer pitch or embracing energy efficiency in the home. The PSAs can be heard on TheVerdeFamily.org, a bilingual Spanish-English website that focuses on the climate impacts Latino communities are experiencing and the many efforts Latinos are already making to solve the problem. On the site, in the PSAs, and in the radio stories, the public including the Latino community can learn of “success stories” by people who are making a difference.